The set_white_label_portal method allows you to manage access to your White Label Client Dashboard for any campaign by creating a custom URL or enabling public access, resetting public access and then disabling public access. Use of the optional Profile ID or Profile Reference ID parameter allows you to show additional campaigns in one white label portal. Refer to the Rank Ranger API Overview page for information on how to obtain API access, obtain an API Key, a full list of API methods and error codes. Optional: your internal reference_id can be used instead of campaign_id if this parameter exists in the campaign (refer to Add Campaign or Update Campaign methods). 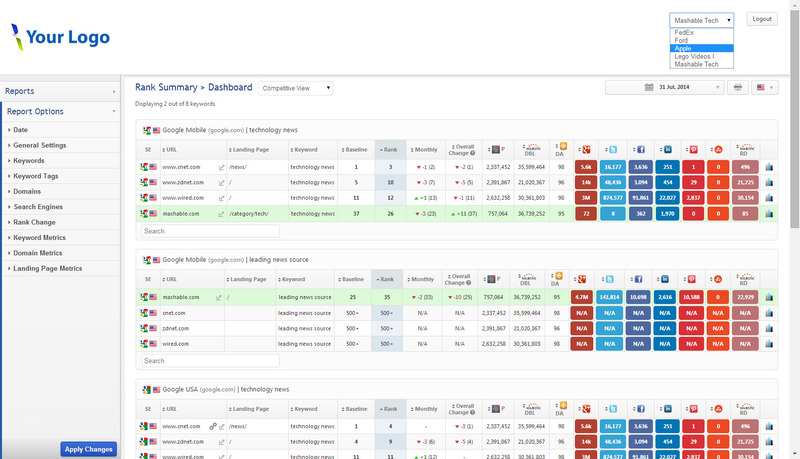 profile_id or use your internal profile_ref_id to view multiple campaigns in one white label dashboard. This parameter must already exist in your account (refer to Add Profile) and be referenced in each of the campaigns you want to view. Refer to Get All Profiles to obtain a list of Profile IDs. Construct & test API requests in the API Console or follow one of the examples below. The default output format is XML, if you want JSON simply add "&output=json" to the end of the string.